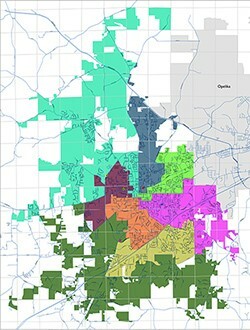 All Auburn voters live in one of eight voting wards determined by your home address. To look up your voting ward and location by address, please visit our Voting Services Map, or enter your address at the bottom of this web page. These voting locations are only for City of Auburn municipal elections. Auburn voters should note that you may have to vote in a different location for County, State and Federal elections than you do for City of Auburn municipal elections. Find your county polling place and more information at alabamavotes.gov or by calling the Lee County Board of Registrars at (334) 737-3635.